Explore, Learn, Have Fun! 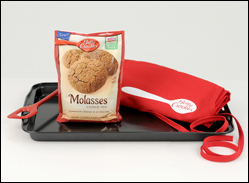 : Betty Crocker Molasses Cookie Review & Giveaway!! Betty Crocker Molasses Cookie Review & Giveaway!! When my package from Myblogspark arrived, it contained the following: a package of new Betty Crocker Molasses Cookie mix, a non-stick cookie sheet, a Betty Crocker apron & a mixing spoon. I couldn't wait to try it all out! Of course, if you've read my blog for long, you know that I love mixing it up when it comes to recipes. I read the directions for the cookies, but I changed things up a bit! I decided to add some pumpkin puree (aboout 2/3 of a cup) instead of the butter, to cut back on the fat - I usually use apple sauce, but it's almost FALL, so it's time for pumpkin!! Otherwise I followed the package directions exactly. But once it was in the mixing bowl, it looked a little lonely, so recipe rebel that I am, I added two tablespoons of butter - just because I felt bad for leaving it out before! Then I added about 3/4 of a cup of chopped pecans. I used a scoop to make larger, uniformly sized cookies on the cookie sheet. (For me it made 12 large cookies, but it will make 3 dozen smaller 2" cookies, according to the package.) I added a couple minutes to the baking time since my cookies were so large. The first six cookies finished baking and looked great. The flavor was fantastic - you could taste the cinnamon & other spices, which gave the cookies a nice bite! The texture was soft and chewy, and they were delicious, just like a homemade cookie. I'm sure if you aren't a recipe rebel like me, the cookies made according to the directions are just as amazing. They would be your classic molasses cookies with a hint of spice. If you try my doctored-up version, be sure to let me know what you think of the recipe! Betty Crocker has been so kind as to share this link for us to download a 75 cent off 1 Molasses Cookie Mix coupon! Even better, they are giving one of you a prize pack identical to the one they sent me! Thanks Betty Crocker! It's easy to enter: I have a couple of mandatory entries, a couple of optional entries, plus a couple of extra things that you can do daily too! You have lots of chances to win! Good luck, y'all! Disclosure: The prize pack for me and the additional prize pack for my winner were provided by Betty Crocker through Myblogspark. All opinions given are honest & completely my own! Never tried this cookie, but it looks great. I have never tried molasses cookies, but I have had a molasses cake before that was good. I've never tried molasses cookies but would love to! Had to take a little time away! Eversave deals for Labor Day! Iloveinns.com Free Night's Stay Giveaway! !